On this barren landscape lacking any form of vegetation, the natural caves and ancient rocky cuttings inspire stories in which history mingles with legends, while superstitions and folklore take shape. 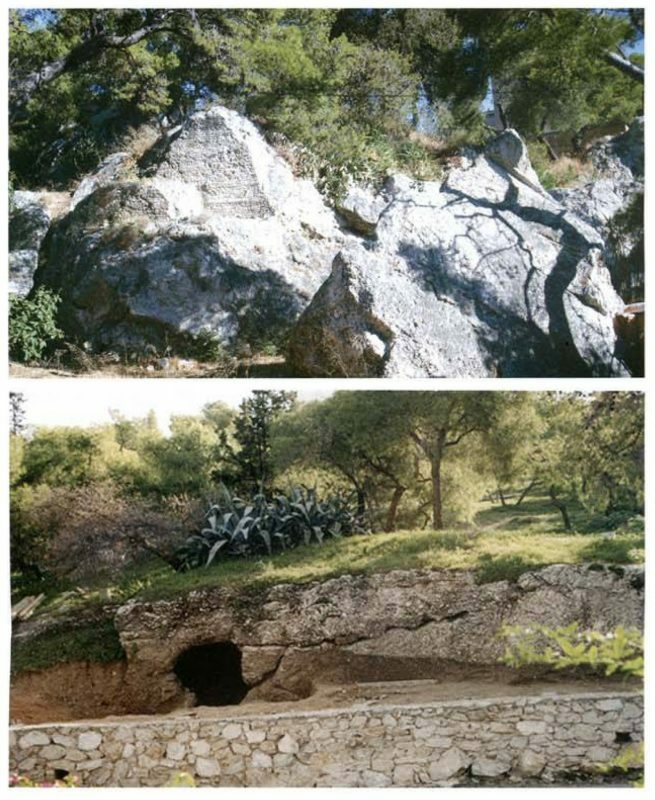 According to medieval tradition, the cave of the “Evil Sisters”, near the ancient Barathron was haunted by the sisters named “Plague”, “Cholera” and “Smallpox”. Dodwell 1819, 396; Kampouroglou 1922, 26–27; Dakoura-Vogiatzoglou 2009. Top: Representation of the “Evil Mother-in-law” rock, upon the Hill of the Nymphs, where, the legend says, resided the “Moirai” and the “Fine Ladies”. Bottom: The cave of the “Evil Sisters”. Photographs by Olga Dakoura-Vogiatzoglou.